I love this quote from Randall Thompson. “I put the notes on paper: they sing it; they are doing something they love to do, just as I have been.” Everyone wins. Everyone is happy. Thank you for the notes on paper, Randall Thompson! 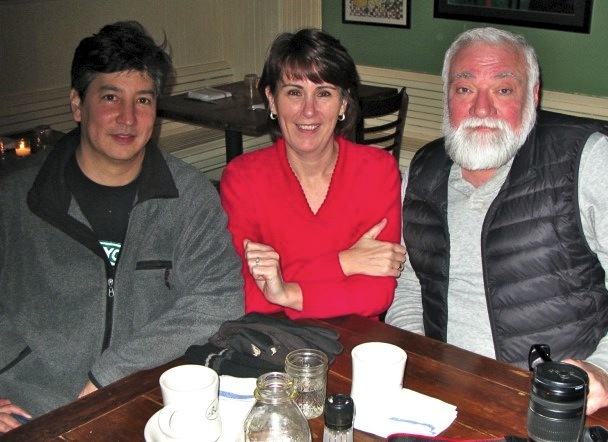 Out to dinner with Josh, Sue, and Santa Claus. I mean Ernest Hemingway. I mean Kevin. 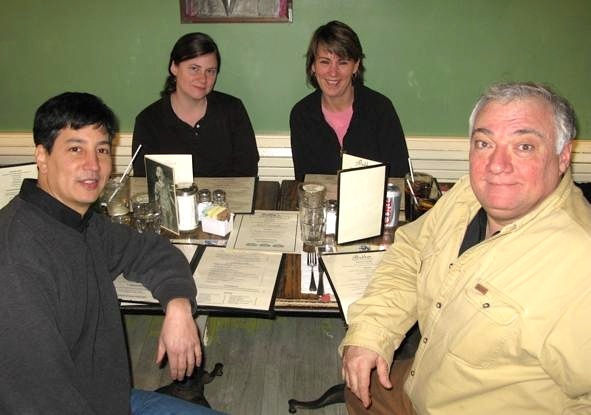 Here we are at the same restaurant, Bubby’s, in January, 2009! Andi, who is in the back next to Susan, couldn’t make it this year due to unforeseen circumstances. You were missed, Andi! Hadley, who was also invited and couldn’t make it, you were missed too!! Well, I see *one* person who hasn’t resorted to dyeing their hair… Yet. I’m strong to finish cause I eats me spinach.